Happy 60th birthday to you! Your birthday is the one days of the year that you know no matter what you can look forward to because the day is all about you! 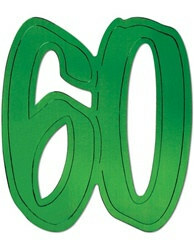 Decorate your party with the 60th Foil Silhouettes. These silhouettes come in bright blue, green, yellow, orange, purple and red so they match many of the other birthday decorations we offer such as the 60th Shimmering Spiral. These 60th foil Silhouettes are twelve (12) inches tall and shine instantly as light hits them, so your guests will see them once they enter the room. Sorry specific colors cannot be requested; if you order more than one you will receive an assortment of colors.